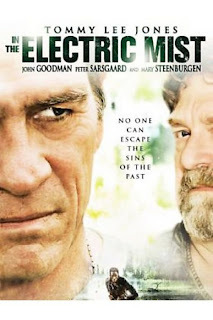 IN THE ELECTRIC MIST is a 2009 mystery/thriller starring Tommy Lee Jones and John Goodman. It is based on a novel titled IN THE ELECTRIC MIST WITH CONFEDERATE DEAD by James Lee Burke. Burke is best known for his series of mystery novels involving a character named Dave Robicheaux; a Louisiana Detective and recovering alcoholic, plagued with demons from his time served in the Vietnam War. Despite the character’s 18 appearances in literary form, Tommy Lee Jones’ portrayal of Robicheaux in IN THE ELECTRIC MIST is only the second time the character has made it on to the big screen. The first being Alec Baldwin’s portrayal in the 1996 film, HEAVEN’S PRISONERS; based on the book of the same title. So right about now, I’m sure you’re asking “what does this have to do with the blues?” Well in addition to the film’s swampy Louisiana setting, it also happens to contain acting performances by Buddy Guy as a local bluesman named Sam “Hogman” Patin and Levon Helm as an LSD induced vision of confederate General John Bell Hood. I’d love to report that this film has a smoking blues score or soundtrack, but unfortunately it does not. There is a scene where Buddy rips some electric blues at an outdoor BBQ, but even that is not filmed particularly well or given much focus within the grand scheme of things. On the blues front IN THE ELECTRIC MIST doesn’t seem to deliver much more than slightly below average acting performances by two root-music legends, which is unfortunate, because the filmmakers missed out on a potentially great opportunity. As for the film itself, its plot involves Robicheaux simultaneously investigating a current series of slain hookers and the mid-1960s murder of a black man whose bones have been dredged up from the swamp by Hurricane Katrina. Which in itself is a little too convoluted, add on the fact that both cases are somehow linked to the local filming of a new Civil War epic, and this film is just plain confusing! Despite the IN THE ELECTRIC MIST’s talented cast, Tommy Lee Jones, John Goodman, Peter Sarsgaard, Ned Beatty and Mary Steenburgen, it was damned to the realm of “straight-to-DVD” and after watching it, I’m not all that surprised. The film is not horrible, but it is not exactly “commercial” either. Other than Guy and Helm, I thought the performances were quite good and perhaps if I were more familiar with the source material, I would not have found the plot so confusing. If you’re a fan of the books, you may find this film more rewarding than I did, but I think that the average viewer may find it a little slow and tedious. It should also be noted that the US DVD release is 15 minutes shorter than the copies of the film distributed to the rest of the world; a factor that may account for the plot seeming a little too convoluted. We unfortunately may have lost some important exposition when that footage hit the cutting room floor.